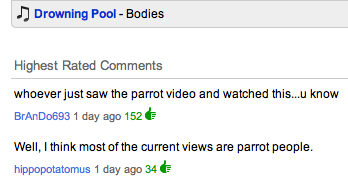 Check out this yellow-nape amazon parrot singing Drowning Pool’s Let the Bodies Hit the Floor. Every time I watch it, I crackup. I enjoy the bird’s rendition way more than the original song. I pulled this from the featured comments on YouTube for the Bodies music video. I haven’t been to Youtube for weeks but I’m glad you made me lol. Why not give the bird an MTV award?